congrats to your and your hubby. owning a home can be stressful but oh so fun! enjoy!!! Good luck with the packing.....the only tips I have are getting friends to help, make sure you have the champagne on ice for the end of the day....and maybe dinner at Mom's!! Ohh Congratulations on becoming a Homeowner!! Tips? I'd say take it one day at a time and remember to LABEL everything!!! =) Good luck! Congrats, Trace! That is beyond exciting. congratulations sweetie!!! that is fantastic news... my biggest tips would be to do it in small increments if possible as to avoid a huge meltdown--that way you can get each room setup without having to do it all at once--good luck and i can't wait to see pics!! label everything! And stop and drink water. We numbered things on boxes and then on index cards write what is in the boxes with the numbers on it. Happy moving! OOooooh HOW EXCITING!! My advice would be to LABEL, LABEL, LABEL!! Congrats! What a big exciting new step in life!!! I can't wait to see what the new house looks like. My tip: Write on the box what is in the inside! Congrats on being homeowners!! Good luck with the move! Lots of bubble wrap! What fantastic News Tracy ~ I am so happy for you!! Make one box with things like a screwdriver, hammer, nails, tape, toilet paper, lightbulbs, all your remotes and wiring for the electronics. I usually pack this box in my car. My Mom says as long as you get your kitchen set up and your bed made on the first day ~ the rest is gravy... Have a blast ~ make it fun and take lots of pictures!! My Boyfriend and i just bought a house back in November. It was a fun but STRESSFUL experience! 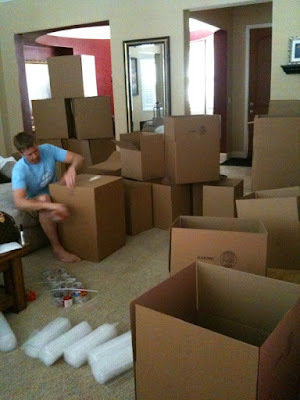 Packing tips... try to load boxes that go in the same room together in the same car load or next to each other in a moving truck. I beleive it makes things alot better! and Color coding with markers when you write on them. (Red, Black, Green, Orange sharpie) I like to think it helped my guy and his A.D.D friends not get side tracked and just put stuff in random rooms. :oD Good Luck! I know that you are big on this, so it should be pretty simple, but color coded dots for each room/boxes is HUGE! I'm sure you will have alot of help which is very helpful as well!!! that is so exciting Tracy - congratulations!!!! i do have one good tip! as much as you may want to decorate and throw things on the walls pronto, it's always best to figure out how you want to arrange your furniture first. i sort of learned this the hard way - while unpacking, i was eager to hang some photos, but upon doing some re-arranging, some of them weren't in the ideal places they could have been! good luck! Even just from moving into an apartment, I had a couple of meltdowns. As everyone else said - try to get help moving from friends or hired help. But at the end of the day, just sit down with husband and appreciate the experience. Look past all the boxes and imagine all the memories you'll make in your new home! Congratulations! Just have alot of time unpacking!! Whohoo, glad your news is out and glad everything is working out!! My advice for moving?! Just take one day at a time and try to be patient the best you can...I get stressed out far too easily when it comes to moving so my goal is to be calm. :) Hope it goes well! I move myself on the 10th and am almost packed up at this point. I keep opening empty drawers thinking something is there when it is not anymore, ha ha! My biggest piece of advice is about the unpacking. Unpack your bed first and get it set up where you want it. That way, at the end of the day when you're both too exhausted too move, you'll have your own bed to sleep in. I had friends come over to help unpack when I moved in but found that for the most part, they weren't very helpful. One friend came over and basically just watched me unpack everything. He didn't help at all. Good luck lady with all the packing -- moving is definitely not fun BUT you are moving to a place to call your own. AND that's the exciting part! I didn't know you lived in Sacramento! So do I! Small world. :) Congrats on the new home! !